A salad with vegetables provides essential nutrients, and it can be the foundation of a low-calorie meal or side dish. Salad dressing can be a source of extra flavor and texture for your salad, and a healthy oil increases the nutrient content. All fats are high in calories and can lead to weight gain if you eat too much of them, so use only a small amount on your low-calorie salad. 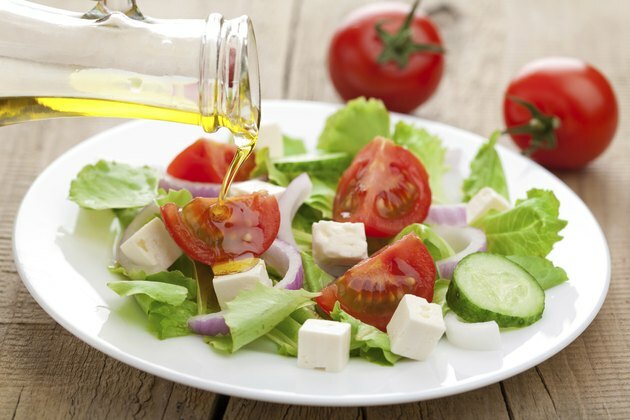 The healthiest oils for a salad dressing are low in saturated fat and high in unsaturated fats because saturated fat raises levels of cholesterol in your blood and may increase your risk for heart disease. You can lower your cholesterol levels by using unsaturated fats instead of saturated fats, according to the 2010 Dietary Guidelines from the U.S. Department of Health and Human Services. Most plant-based oils are low in saturated fat, but your heart-healthy salad dressing should not contain highly saturated oils, such as palm and coconut. Olive, canola and peanut oil are high in monounsaturated fatty acids, which may lower your total and LDL cholesterol levels, according to the Mayo Clinic. A Mediterranean diet pattern is high in monounsaturated fatty acids, and eating more of them may lower your risk for heart disease. You can add more monounsaturated fatty acids to your salad by including avocadoes or olives, which also have dietary fiber. However, olives are high in sodium, which may raise your blood pressure and increase your risk for heart disease. Polyunsaturated fatty acids can be heart-healthy, and they are good sources of vitamin E, an antioxidant, according to the 2010 Dietary Guidelines from the U.S. Department of Health and Human Services. Good choices for a salad dressing include corn, safflower, sunflower and soybean oils. If you are purchasing an oil-based salad dressing, read the label to be sure that it does not contain trans fats from partially hydrogenated oils. To limit the saturated fat content of your salad, choose a lean source of protein, such as grilled chicken or egg whites, instead of full-fat cheese or fatty meats, such as salami or Italian meats. Flaxseed oil makes a healthy salad dressing because it is the most concentrated source of alpha-linolenic acid, an essential omega-3 fatty acid, according to the Linus Pauling Institute Micronutrient Information Center. Each tbsp. has 7.3 g of alpha-linolenic acid, or about 450 percent of the daily value for this cholesterol-lowering fatty acid. You can further increase your intake of omega-3 fatty acids in your salad by adding walnuts or fatty fish, such as tuna or salmon. How Many Calories Are in a Tossed Salad? Do Tomato & Cucumber Salads Help You Lose Weight?